In a perfect world, all puppies would meet 100 people before 12 weeks, including babies and the elderly, teenagers and children, tall men with beards and short, women with hats, etc. They would also play with many other puppies, meet and greet older dogs, see bicycles, skateboards, horses, cats, buses and anything else they might otherwise experience as new and strange threats later in life. I always compare that open mind of those young puppies to children, who learn new languages with ease: It’s a short window of brain development that closes, making it more difficult (or scary in the case of dogs) later on. One reason puppies need to meet other puppies and dogs is to learn the ABCs of dog communication, including both dominant and submissive gestures. An unsocialized puppy can grow into a dog that does not understand how to read and respond appropriately to the body language (tails, stance, ears, etc.) of other dogs, which can lead to dog-on-dog aggression. Worse, a puppy not familiarized to a large variety of people at that early age might show dog-on-human aggression, which is obviously particularly dangerous. 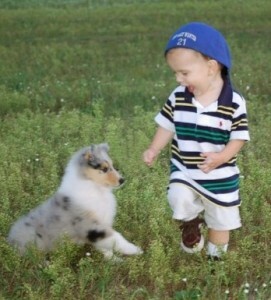 Keep these development stages in mind as you introduce your puppy to the world. But even if you adopt a dog that missed out on an intensive socialization program, many (though not all) of the resulting imbalances can be addressed with focused training and behavior modification exercises.